Link 2 #POTUS' Tweet ==> #AdamSchiff "[knowingly] & unlawfully lying & leaking, should be forced 2resign from #Congress!" He's been one of the "Gang of 8", & having pushed falsifications, must go! Link 2 @RepDougCollins Tweet ==> Release of #NellieOhr transcripts. Form this doc we fin numerous points of note. 3) Among them, #Q notes age 17 which has #NellieOhr confirming she works for the #C_A as an independent contractor. 2. #QANON "ABC agencies" : US Intel Community (IC) is a federation of 16 separate US gov intel agencies & a 17th admin office, that work separately & together. 1. #QAnon What is Ruth Bader Ginsburg's current state of health? Are pictures of her being avoided for a reason? 3. #QAnon Rep Collins has just released the transcript of George Papadopoulos's interview before the Judiciary Committee. Quite something: Details Mifsud working w FBI to set him up with Roman wine store manager touted fraudulently as "Putin's niece". Link 2 #CSpan ==> Flowers v. Mississippi Oral Argument 20th March 2019. This case is concerned w/racial bis=as in jury selection. 2) #DSMedia could cover her movements to & from hearings, like the one in this link, but it wouldn't fit their operational parameters. They don't want it out that her health is failing, so you don't see images of her coming & going from home or her vehicle. They'd be easy shots. Link 2 @RepDougCollins Tweet ==> Release of #GeorgePapadopoulos testimony! Here's the downloadable pdf 2begin researching. Keep 'em coming #DougCollins, #QSentMe. #QAlert 3/23/19 This will be my Thread for Saturday, March 23, 2019. Nobody walks away from this. And more! Cool they’re covering our movement. DO NOT TRUST THE #FAKENEWS MEDIA. 3. #QAnon "What does a dog do?" Dig, anons. NZ shooter had "🐟 + 14" on gun as did Podesta on hands, also in NZ on Mar 10. msn.com/en-nz/news/nat… NZ shooter on 8chan to justify MSM calls to kill 8chan? Did NZ shooter've a MKUltra therapist? Who paid for travel to ME? Seal? President Trump just left the Pentagon where he met with National Security officials- NSA. Chatter has increased, respectively to the PANIC in DC. The plan has been set- All systems GO. Be vigilant. Keep your head on a swivel and if you see something hinky say something. This week's calendar had two important deadlines- One- @GenFlynn's trial update/status report- Delayed sentencing again. Two- Rick Gates sentencing in Mueller inv.- Delayed 60 days. 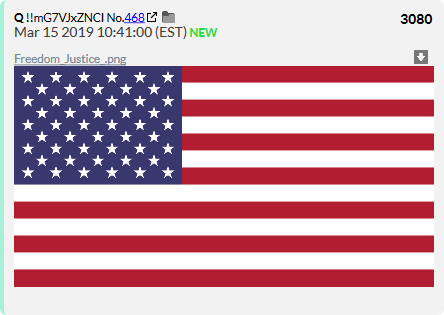 The importance of Anons (Patriots) and your commitment thus far is incalculable. #QAlert 3/12/19 This will be my Thread for Tuesday, March 12, 2019. Do you believe the timing is a coincidence? And more! Do you believe the timing is a coincidence? @M2Madness has me BLOCKED... So much for WWG1WGA. Congrats M2M! Q Sent me! Lisa Barsoomian = [RR] wife? Lisa Barsoomian = rep BILL CLINTON? [MUELLER] connection to U1 & Russia? Here is the article... Trump has been hanging on to multiple docs that could/should be declassified that would be devastating to the Democrats. He is holding these to release at a beneficial strategic time. Anons wish he would just do full DECLAS already! What DARPA team members now at FACEBOOK? ➡️➡️He took over for Regina Dugan- ex DARPA, who went to Google, Then FB. Decided to break down time stamp of the The Trump Card QPost 2936 from 3/3/2019 (Pic1). Which lead me to QPost 832.,. Looking @ Post 832, and the 1st thing that jumped @ me was that it was post EXACTLY 1 year prior to post 2936! NOT a coincidence!! 5th Line: This is not a game. Plays in to EXACTLY what #VincentKennedy @VincentCrypt46 tweeted yesterday.,.
! Game for some. => Not Game for some. The “Game” narrative fits perfectly with Line 5 of Post 832.,. #Q drop 2950 - 'Meet The Press' link was DELETED! #Q Drop 2946 - ICYMI - this was the link! #QAlert 3/3/19 This will be my Thread for Sunday, March 3, 2019. WE STAND TOGETHER. WWG1WGA!!! And more! Physical landscape +/- 'proves' it could not have been taken pre_2016. Could not have been taken post_2016. I love that POTUS mentioned the Great Tariff Debate and President McKinley! Trump unleashed-this is why we ❤️ him!! !